If you were anything like us growing up, the most exciting guest of honor at your tea parties was probably a Cabbage Patch Kid. 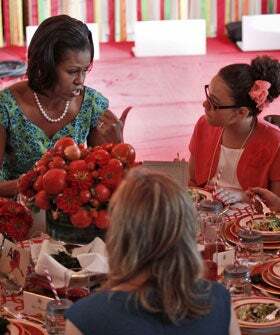 We definitely weren't as lucky as the 54 children who got to spend the day with Michelle Obama at the first-ever White House Kids’ State Dinner. The prez himself even crashed the party and celebrated with the young guests, who were all winners of a national healthy recipe challenge.